Ghosts, goblins, rockstars, fairies, princesses and superheroes – plus young artists – should mark their calendars to attend the 22nd annual Trick or Treat Trot taking place Friday, Oct. 31 in the streets of Vail Village and Lionshead. Children, ages infant through 10 years old and their families, are invited to participate in the Vail Recreation District’s Halloween festivities, which will begin at 1 p.m. at the Vail Public Library featuring a Halloween Story Hour. From 2 to 5 p.m. costumed children will gather and trick-or-treat through the streets of Vail Village and Lionshead village receiving goodies from participating merchants. Participating merchants are identifiable by an oversized jack-o-lantern bag displayed at their entrance and will offer children safe treats. 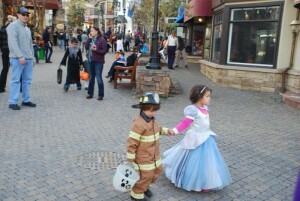 In past years, over 300 children and their families have participated in this informal costume parade and celebrated Halloween in the shops and restaurants of Vail. Children also are invited to enter the annual Trick or Treat Trot coloring contest. Entry forms are available by clicking here or at local schools, preschools and in the Vail Daily and Weekly Daily. To participate, children are asked to decorate the contest form or submit their own Halloween-inspired drawing to the Imagination Station in Lionshead or at Red Sandstone or Edwards Elementary Schools by 5 p.m. Friday, Oct. 24. Prizes will be given to the top three designs in each age category. Winners will be announced during the Trick or Treat Trot. A limited number of Trick or Treat Trot bags will be available at the Covered Bridge in Vail Village and near the archway in Lionshead on a first-come, first-served basis. The VRD also encourages participants to bring their own reusable bags. Trick or Treat Trot is organized by VRD Community Programming and sponsored by Vail Daily and Pazzo’s Pizzeria. For more information on the Halloween festivities, call 970-479-2292 or e-mail community@vailrec.com.